Jeremy Chardy will take on Romanian Marius Copil in the second round at the ATP 500 event in Washington, played on outdoor hard. Chardy played some great tennis in the last couple of months on grass, reaching an ATP final (Hertogenbosch), an ATP semifinal (Queens) and winning the Surbiton challenger. He had an excellent grass court season, even if he did suffer a first round exit in Wimbledon against Shapovalov. The Frenchman returned on hard courts last week in Atlanta where he lost to Norrie in the second round, after winning against Berankis in the first. Here in Washington he had a bye in the opening round, so this will be his first match. The 93rd ranked Copil didn`t have much success in the last few months. In fact, his form was pretty bad, as he passed the second round of an ATP tournament just once since February (a QF in Hertogenbosch 6 weeks ago). After the grass court season ended Copil played two matches on the American hard courts, losing against Tiafoe last week in Atlanta and defeating Basic 7-6 6-4 in the first round here in Washington. It was a good bounce back win for Copil, which should give him some confidence for this match against Chardy. Bet on Chardy v Copil and claim a 100% (100 Eur) welcome bonus at Ohmbet now! The two playes met just once on tour, and that was way back in 2013 on grass, when Chardy won 7-5 6-4. Both guys are solid hard court players and both own powerful & dynamic serves, which should help them on the fast surface here in Washington. Copil served very well in the first round against Basic. Even though he did lose serve twice, those were kind of fluke breaks of serve, as Basic converted his only two break points and didn`t even get to deuce on any other of the Copil service games. Copil won 5 of his 11 service games to nil. 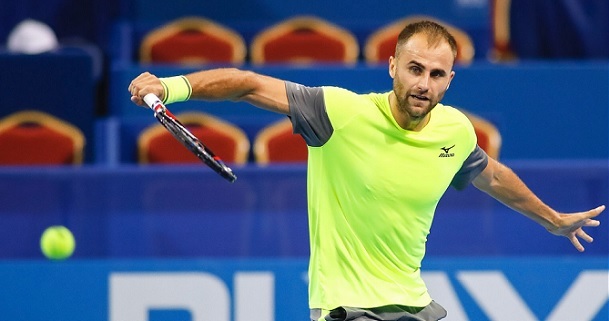 The serve has always been a great indication of Copil’s level and potential in a tournament, so after a very solid service display you would expect him to have a good game against Chardy, who will be a difficult test, but who is not a world beater. The Frenchman is the better player in better long term form, but he didn`t play great at all last week in Atlanta, showing weaknesses on hard courts after his excellent grass court season. It`s hard to see him simply steamrolling Copil, and chances are Chardy will have some work to do if he is to win the match. When it`s all said and done, you would expect both these big servers to stay safe on their deliveries on these fast courts in Washington. When they are in a good serving day they can both slap the ball with incredible power, almost Karlovic style. At least a tiebreak could very well occur, and three sets are a real possibility. My tip will be over 22,5 games to be played. Indeed a result of 7-6 6-3 could represent a potential danger, but there is no betting without risk. I reckon the odds are more than good enough to make this bet worth taking. Prediction: Jeremy Chardy – Marius Copil 6-7 6-4 6-4.